83 Main Street is a delightful traditional terraced cottage in the heart of the pretty conservation village of Port Charlotte and has recently been extensively upgraded to a high standard to provide luxury accommodation for 6-8 people. There is a safe enclosed garden with patio, garden furniture and a barbecue. There is parking for two cars to the rear of the property in addition to off street parking at the main entrance. 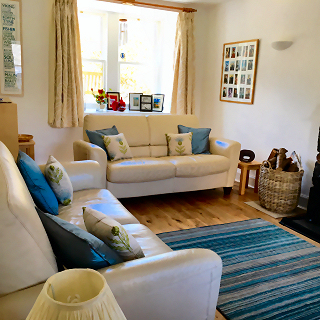 The accommodation comprises one double bedroom, two twin bedrooms, a spacious bright living room (with sofa bed), fully fitted dining kitchen, bathroom with shower and a further shower room. We provide free wi-fi and Sky TV. There is central heating throughout and an open fire in the living room. Bedlinen and towels (not beach towels) are provided. Washing machine and tumble dryer. Port Charlotte has long been a favourite subject for artists and is undoubtedly one of the loveliest spots on Islay. A 2 minute stroll takes you to a clean, safe sandy beach on the shores of Loch Indaal, with uninterrupted views across to Bowmore and the Paps of Jura or down the loch to the Mull of Oa and beyond to Ireland. 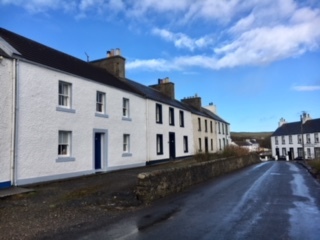 Port Charlotte boasts two hotels, each with restaurants specialising in local produce, 2 further bistros, a children’s play park, a Post Office and mini-market which also sells petrol, all within easy walking distance of the cottage. All that Islay has to offer is within easy reach; the many wonderful unspoilt beaches, the championship golf links at Machrie, bird-watching, cycling, fishing, shooting and last but not least world-famous distilleries.